Foodies and gardeners will love these books too. 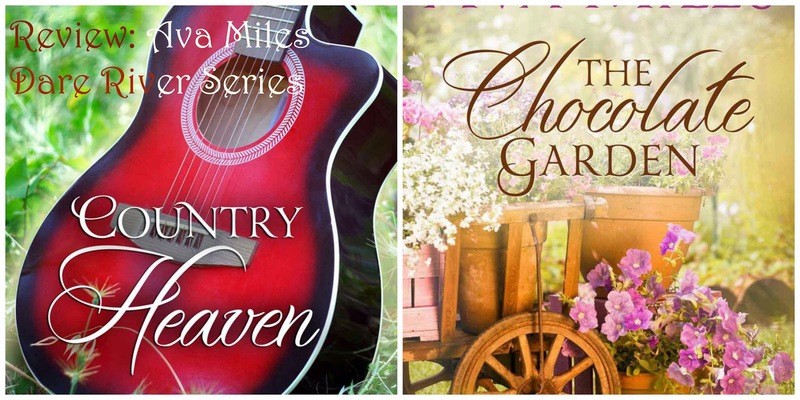 Miles uses her experience as a chef for the story of Country Heaven. I'm certainly not the only gardening fan that will take great pleasure in reading about the planning of the Chocolate Garden. Plus for country music fans, there's enough Nashville backstories in both novels to hold your interest. When I start reading one of Ava Miles books, I know there will be a happily-ever-after. But beyond that, I know the journey to that place will be filled with interesting details and background, compelling characters, a bit of mystery or intrigue, and love. Yes, Ava Miles is on my must-read, auto-buy list and these two Dare River novels perfectly illustrate why. Miles dishes up some irresistible country love! When I began reading the first Dare River novel, I wasn't sure what to expect from the character of country music star, Rye Crenshaw. From his appearances in previous Miles' novels, I knew he was a good ol' boy who loved good food, but beyond that not much more. Without a doubt, I was curious and had a feeling that soon he'd be having his own story, but hadn't anticipated a spinoff series. Quite cleverly, Miles had placed his Nashville home along the Dare River, so what could be a more effective brand tie-in than Dare Valley and Dare River. However, reading Country Heaven, I wasn't thinking of branding or cute names, but was enjoying the freedom that Miles was having in telling the story of Rye and Tory Simmons, the gem of a cook he found in a roadside diner. Remember, I mentioned he loved to eat. Well, once initial prickliness was set aside and he experienced Tori's cooking, this graduate student soon had a job as his personal chef. Tori is a strong, salt-of-the-earth character who dispenses wisdom and love with every meal she prepares. Like her grandmother, whose recipes she wants to use to turn into a book, Tori's warmth and kindness is clearly evident. I love her take-no-prisoners attitude with Rye when she walks into him relaxing - along with a groupie - and when she refuses to wear the see-through apron that his former cook/mistress had left behind. In addition to the romance, Country Heaven also focuses on family - and what family really means. Once again, I cried and laughed as I read Miles' story, but when I turned the last page a bit of happiness stayed with me. Yes, that's the true magic of reading an Ava Miles book, she shares her happiness with her readers and it's quite a wonderful gift to receive. One of the casualties of Country Heaven, the first Dare River book, was Rye Crenshaw's sister, Tammy and her two children. Remaking her life with him and Tori in Nashville is a bit scary, but quite exciting for this ever-so-proper Southern lady. Her evolution of inner freedom is a delight to read and the moment when her younger sister discusses cutting her hose to pieces, a revolutionary act like bra burning in the 70s, I was dissolving in laughter. For me, the centerpiece of The Chocolate Garden was Tammy's inner transformation from down-trodden, stiff-upper-lip, country club wife to a woman of passion and confidence. Each step, from cutting her hair to choosing new clothes is lovingly depicted by Miles. Her ability to convey the societal strictures that had bound Tammy so tightly were most convincing - as was her portrait of Tammy's mother. Tammy's children had captured my heart in Country Heaven and it was wonderful to see them spreading their little wings here. But J.P. McGuiness (John Parker McGuiness) was the one who walked away with my heart. Oh my goodness, Ava Miles, you just keep writing the best book boyfriends any girl could wish for. Yes, this Nashville lawyer and college friend of Tammy's brother, is a guy any woman would want fighting on her side. It's clear from the opening pages of a wedding scene, that John Parker (as Tammy alone calls him) recognizes Tammy as his "one and only." To me, that recognition is the mark of a brave and secure man. I love reading romances where the alpha hero fears love and commitment, but what really sends my book heart into a flutter is when the alpha hero is secure within himself. Yes, John Parker is that man and I had faith in him, from the beginning, that somehow this story would have a happily-ever-after. There's plenty of conflict, between Tammy's desire to stand on her own, a crazy stalker, the search for the tabloid leak, and providing the children security when they feel their security ripped away. When Tammy and John Parker finally confront their desire for one another, oh my goodness, my eReader was sizzling! Just as a bit of fairy magic is invoked to solve some of these conflicts and encourage romance, I think Miles sprinkled a bit virtually on the pages as this story just swept me away. With each plant that was chosen, I'd imagine the fragrance. The songs sung? Yes, I think I heard music too. It's a real gifted writer who can achieve these magical leaps for a reader - and that's why with each book I add to my Ava Miles' bookshelf, I beam a bit inside. Yes, there's a shelf full of happiness in my eReader courtesy of Miles.